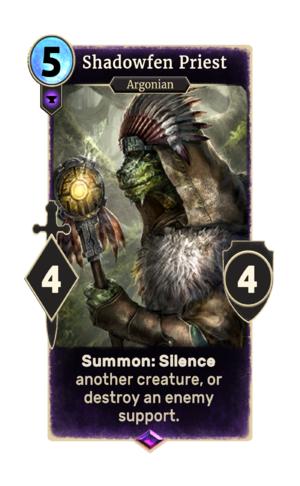 Summon: Silence another creature, or destroy an enemy support. Shadowfen Priest is an epic Endurance creature card. It is part of the Core Set. In addition to the card's availability in the Core Set, one copy is included in the Aela's Companions theme deck. One copy is also obtainable in the Imperial Might deck as a reward from The Restless Dead. If used on a creature, this card's summon ability applies the Shadow's Curse card effect. The card is named for the Shadowfen region of Black Marsh. This page was last modified on 15 February 2019, at 19:05.